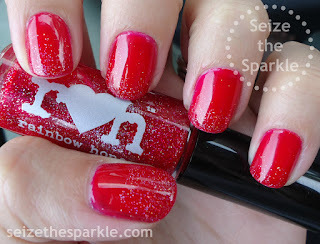 It's a good thing Jelly Red Sandals was included in the August Mystery Bag from Rainbow Honey. Had it arrived sooner, I might not have had the patience to wait for today! Jelly Red Sandals is a bright red jelly polish that's insanely squishy. Three thin coats and I could easily have been on my way. But I thought it would be fun to add a little bit of glitter to the mix in the form of a gradient on my tips. At first, I was going to use The Master, but I quickly realized it was too pink. Then, I remembered Crimson Nebula. The jelly base in that is just a smidge darker and slightly more blue leaning than Jelly Red Sandals. I'm talking very, very slight differences between the two! Using a makeup sponge, I dabbed Crimson Nebula onto my tips for a very subtle touch of sparkle. What is it about extra-fine holographic glitter that I'm drawn to? It's a little bit weird, because I don't really gravitate toward holographic polishes. The glitter has got to be balanced justright. It can't be too sparsely distributed, but there also can't be so much glitter that it overloads the base and turns the polish into a true holo. I'm just weird like that!